Know which products are performing and which are not, and plan for the future inventory accordingly. Never run at risk of missing a single sale due to over-stocking or under-stocking at any point in time. Get easy access to precise, up-to-date data on cost, inventory, sales, and profitability through easy-to-understand reports. Discover trends, identify weaknesses and strengths, and fill gaps with actionable reports. Automated reporting cycles ensure all stock is accounted for and there is decreased discrepancies with what is recorded and what actually is there. Grow profitably while eliminating wasted time and resources. Improve inventory turnover with improved inventory movement. The higher the turnover rate, the less the time inventory stock sits on the shelf and more the cashflows with your valuable capital being used in the best way. 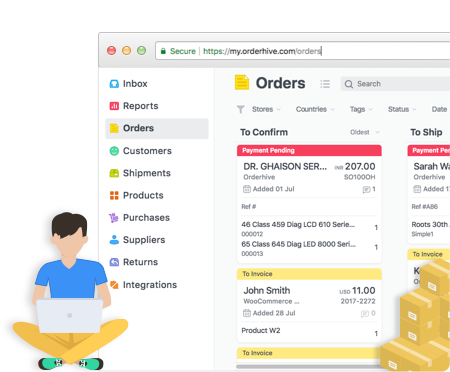 Make better, data-driven decisions and learn how to improve your business with Orderhive’s cross-channel e-commerce reporting. Generate reports with beautiful visuals and up-to-date data. See how inventory moves through warehouse, sales, shipping, and purchases, with filtering options for easy & quick analysis. Know your best and worst performing products, variants, product categories, geographies, customers and sales channels. Know in-and-out of your purchases, and manage your cashflows and profitability with an insight to know where to focus next. Get real-time analytical reports related to shipments, customer, invoice transactions and order returns, all in an easy-to-infer format. My business hasn't scaled a lot, why is it still necessary to maintain the business analytics and reports of the sales? Well, analytics and reporting of sales is the biggest stepping stone to the growth of your business. By what is sold with how much effort, can help you analyze the demand of a particular product. Business reporting can forecast the demand; replenishing the stock accordingly will help you drive your business in the correct direction. I already know what products I sell. How can business analytics & reporting improvise my selling? Now, the products that you are selling can either belong to a specific or more than one category. In this case, the business reporting and analytics can help you out with the numbers. The numbers can be of sales, over- or under-stocking of products, etc. This will enable you to focus on the products that are swiftly getting sold, and not invest in what is simply sitting in your warehouse. In what ways can the business reporting software help with warehouse and inventory audits? Orderhive’s business analytics & reporting software can help you with the inventory summary, highlighting the low- and out-of-stock products, back-ordered inventory, valuation by cost/purchase price. It will also assist you with the order summary, store & customer sales report, etc. With all the mentioned records, you can easily audit your inventory and warehouse. Is the data provided by the business reporting tool reliable? Can Orderhive guarantee accuracy? Orderhive’s business analytics & reporting tool is always there to assist you with data, but relying on software is never advised. The accuracy of the software depends on how well you involve it with your business. The more correct data you provide to the software, the better reports it will generate, and eventually – a better business. What makes Orderhive's business reporting software worthy of being subscribed? Orderhive never promises wonders for your business but does provide a 15-day trial of the business analytics & reporting tool. This is to make you understand how well can the software be integrated to your retail business. Like it, there are three packages – ‘Starter’ at $99.99 per month, ‘Professional’ at $199.99 per month, and ‘Growth’ at $299.99 per month. For the businesses which might need some other tailor-made features and functionalities, there’s Orderhive Enterprise. Is there any browser in particular that the business reporting software demands for a smooth experience? Orderhive’s business analytics & reporting tool can work seamlessly on Google Chrome, Firefox, Safari, Microsoft Edge; these are some of the most commonly used and best browsers. Orderhive users haven’t faced any sort of issues with other browsers as well, apart from the ones mentioned above. So, there is no need to be dependent on a particular browser, rather stick to what you often use. If at all I am not able to understand a functionality in the business reporting software, will I get any assistance from the Orderhive staff? Certainly! We understand that there are chances where you might get a hiccup while using Orderhive’s business analytics & reporting software, and so for the same, we have our support staff always to your assistance, either on call or on live chat.